After hearing the band's progression from Savage Land to Temple of Two Suns, I could only wonder what level the band would reach with their third album. 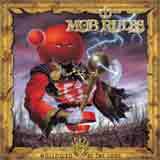 Mob Rules has certainly delivered the goods in a big way: this release will surely show up in my top 10 list for 2002. Just as the band improved its sound from Savage Land to Temple of Two Suns, the band has again taken a big step forward with Hollowed Be Thy Name. Of course, the core sound that is Mob Rules remains fully intact for Hollowed Be Thy Name. Each and every song contains addictive melodies, tight production, and fabulous lead vocals. However, the song structures are even more clever and complex than before. From the thunderous title track to the epic Way of the World concluding the album (featuring Roland Grapow), the well thought symphonic arrangements give each track a thicker, bigger sound than they have achieved in the past. The symphonic elements remind me a lot of what Rage tried to do with their Ghosts album, although Hollowed Be Thy Name is certainly much different. Peavey Wagner of Rage does contribute on one track, How the Gypsy Was Born, so that could explain why that album comes to mind. While I enjoy the Ghosts album of Rage a lot, I think it could have been better had they not sacrificed so much of their power on that album. Fortunately, Mob Rules has added to their sound with very effective and thick symphonic arrangements, but they have not sacrificed their power at all. House On Fire and How The Gypsy Was Born offer the only real mellow moments of the disc, but both songs are certainly as worthy as the other tracks of being on this album. Other than that, there are seven powerful tracks with an occasional nod to hard rock and one brief instrumental. Simply put, there is not a boring moment on this album. I am pleased to tell you that each of the songs is of high quality and maintains the listener's interest after multiple listens. Anyone that enjoyed either of the band's first two albums will certainly enjoy this one as well. In a time where so many copy cat power metal bands are competing for attention in the metal scene, Mob Rules delivers an album with a sound all their own that is unquestionably worth your attention. If you like power metal and/or melodic music, I strongly recommend this album and then work your way back to the band's first two albums after you experience this one.